It has been long recognized by the investment community that power in Turkey was concentrated in Erdogan's hands. He enjoys incredible power in the ceremonial presidential post and brooks no rivals. Common among authoritarian leaders they habitually turn on hand-picked successors as they grow fearful of competitors. This is precisely what has played out in Turkey in recent days and now has come to a head. Prime Minister Davutoglu returned from a trip to Europe and the Middle East to find that some of his powers had been stripped. Davutoglu had been selected by Erdogan as his replacement as Prime Minister while Erdogan moved into the Presidency. Erdogan wanted the power of both positions and expected to control the Prime Minister. Davutoglu is more moderate and favored more orthodox policies than Erdogan. Davutoglu was the one who negotiated the refugee deal with Europe that included visa-free travel to the Schengen area by Turkish passport holders. He was photographed enjoying himself with Merkel. Frustrated with Erdogan's power grab, and apparently without sufficient party (AKP) support, Davutoglu is preparing to resign. That is behind the call for an extraordinary party congress in a fortnight and the lira's sharp sell-off in the thin trading condition in the NY afternoon. A new prime minister is ostensibly to be picked. Of course, the domestic press threw up several possibilities. All of which are loyalists (to Erdogan), including a son-in-law. Davutoglu would not run. He is expected to make a formal statement at press conference before midday Thursday in Turkey. Davutoglu was more pro-Europe than Erdogan. The political demise of Davutoglu is a loss for Europe. He was a Turkish official with whom political elite in Europe could deal. His departure puts at risk the refugee deal that had already appeared to have slowed the flow into Greece to a fraction of what it was previously. Erdogan had little to do with the negotiations. He does not own them, and his support for them was lukewarm at best. There are many things, often in conflict, that drive currency and asset prices. It is not like the EU-Turkey agreement drove prices. However, on the face of it, risk that the refugee deal unravels rises if Davutoglu leaves the government. It would further undermine the political center in Europe. It would seem to be another political blunder in dealing with the refugee crisis. It may further tarnish Merkel's gravitas. 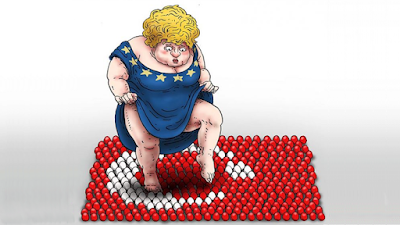 her popular standing among German politicians has already slipped. The CDU is polling ahead of the SPD but only barely. A breakdown of the agreement would be terrible for Greece if the flow of refugees dramatically increased again. Negotiations with the official creditors has become more intense after the IMF insisted on new conditions if it is to participate in deal that was struck amid much fanfare last summer. It is not good for Turkey, if for no other reason than it distracts policymakers from the pressing issues of inflation, foreign debt, and the insurgency in major cities. We have seen this movie. Authoritarian leader prevent the emergence of other potential sources of power. The regime becomes insular, corrupt and cruel. Despite whatever noble goals it once had, people's lives become more miserable. It never ends well, though its tenure is hard to predict.